PLEASE READ CAREFULLY, AS OUR SHUTTLE SERVICE OPTIONS HAVE CHANGED FROM PREVIOUS YEARS! Here are options for transportation for the Allerton Conference. You must arrange your own transportation. Only transportation that is provided, will be for the registrants staying at the Allerton Conference venue, after the Welcome Reception. Mention that you are attending the “Allerton Conference”. Visit website for more information. Please make reservations via email with payment at least 2 days before arriving to Champaign-Urbana. Click here for Credit Card Authorization Form for Starr Limousine Service. Champaign-Urbana is located at the junction of I-57, I-72, and I-74, about 130 miles south of Chicago and 110 miles west of Indianapolis. Air:(CMI) Willard Airport is served by American Eagle (Chicago, Dallas/Ft. Worth) and United Airway . Rail: Amtrak provides daily service from Chicago to Champaign’s Illinois Terminal. 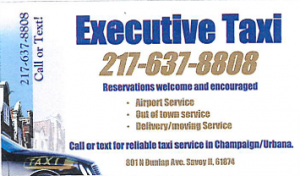 Bus: Check Greyhound’ s listings for routes between Chicago and Champaign’s Illinois Terminal.